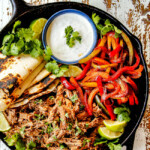 Pork Fajitas slow cooked in honey, lime, salsa verde goodness then topped with sizzling bell peppers for outrageously easy, juicy fajitas every time. These Pork Fajitas are restaurant delicious and the best part is the slow cooker does most of the work! They are a perfect for all those busy nights when you have just 15 minutes to stir fry some peppers and pile on your juicy, tangy, fall-apart-tender pork. You can make pork fajitas loaded with all your favorite toppings or pork fajita salad bowls, pork fajita burritos or a pork fajita bar all from this Pork Fajitas recipe! The pork also freezes and reheats beautifully for a quick and easy dinner that is healthy, satisfying and tastes better than any restaurant at a fraction of the cost. Prepare Salsa Verde Pork according to directions. Prepare Salsa Verde Ranch Crema by whisking together all of the ingredients together in a small bowl. Cover and store in the refrigerator until ready to serve. When ready to serve, add one tablespoon olive oil to a large cast iron skillet and heat over medium high heat. Once very hot, add bell peppers, onion and all spices listed beneath bell peppers. Sauté for 3-4 minutes or until crisp-tender. Stir in 1/2 tablespoon lime juice. Assemble fajitas by layering tortillas with cheese (optional), salsa verde pork, bell peppers and desired toppings. Top with Salsa Verde Ranch Crema and hot sauce.